The Telluride Bluegrass Festival has become an annual destination for acoustic music fans who make the pilgrimage to this town in Colorado's San Juan Mountains. 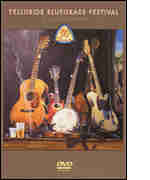 This DVD includes performances from the festival's 30th anniversary, as well as interviews and behind-the-scenes footage. 107 minutes. These courses teach you step-by step how to sing in harmony. You'll also learn an easy way to figure out harmony singing parts from you guitar. Works for all vocal ranges. Great for practicing in the car! 2 1-hour CD's. 20 songs. These courses teach you step-by step how to sing in harmony. You'll also learn an easy way to figure out harmony singing parts from you guitar. Works for all vocal ranges. Great for practicing in the car! 2 1-hour CD's. 31 songs. These courses teach you step-by step how to sing in harmony. You'll also learn an easy way to figure out harmony singing parts from you guitar. Works for all vocal ranges. Great for practicing in the car! 2 1-hour CD's. 28 songs.